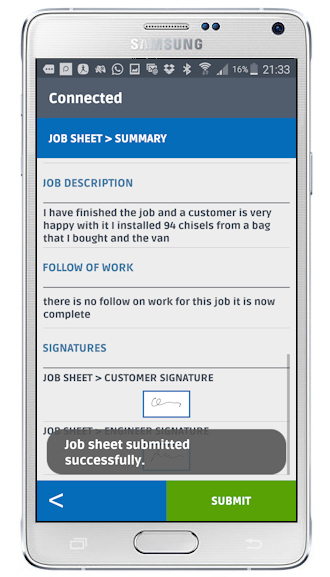 Replacing paper jobsheets in the field has to be one of the goals of any field based service business. You never have to replace an electronic job sheet, they don't get lost, they are never left at home and everyone who needs to, can see them as soon as they are created. The e-jobsheet wraps everything into a nice pdf that can be sent to everyone that needs to know. But even this isn't really necessary with Flobot because everyone who needs to know has access through the system, the client portal or the Field Team Members portal. None-the-less pdfs are simple and easy to email and provide a permanent record of the job details. Your electronic jobsheet can contain pictures of the job, notes taken, signatures from the customer and even a geo-located, time stamp - with a map of where it was signed. It is an infallible record of the job or service that has taken place. It means reduced costs and increased efficiency in management talk. In everyone else's language it just makes life a little easier. Flobot Field has been designed from day one to work without a connection - not forever of course, but it will save everything until you are connected. That's what Flobot is all about - bulletproof communication for field and office staff combining old and new technologies to ensure delivery, post, email, SMS, mobile - it's all covered.